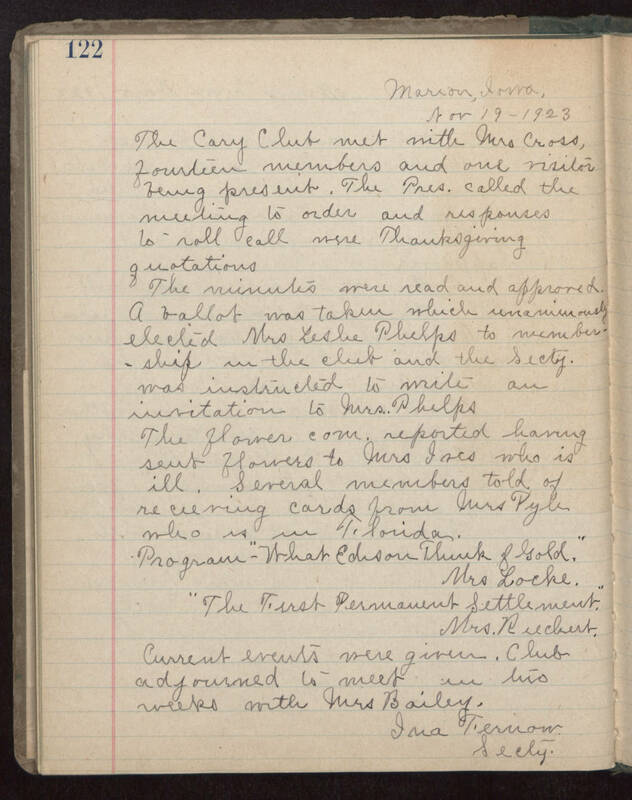 Marion, Iowa Nov 19 1923 The Cary Club met with Mrs Cross Fourteen members and one visitor were present. The Pres. called the meeting to order and responses to roll call were Thanksgiving quotations The minutes were read and approved. A ballot was taken which unanimously elected Mrs Leslie Phelps to membership in the club and the Secty. was instructed to write an invitation to Mrs. Phelps The flower com. reported having sent flowers to Mrs Ines who is ill. Several members told of receiving cards from Mrs Pyle who is in Florida. Program - "What Edison Think of Gold." Mrs Locke. "The First Permanent Settlement." Mrs. Riechert. Current events were given. Club adjourned to meet in two weeks with Mrs Bailey. Ima Ternow Secty.